Before Austin became the "live music capital of the world" and attracted tens of thousands of music fans, it had a vibrant local music scene that spanned late sixties psychedelic and avant-garde rock to early eighties punk. Venues such as the Vulcan Gas Company and the Armadillo World Headquarters hosted both innovative local musicians and big-name touring acts. Poster artists not only advertised the performances--they visually defined the music and culture of Austin during this pivotal period. Their posters promoted an alternative lifestyle that permeated the city and reflected Austin's transformation from a sleepy university town into a veritable oasis of underground artistic and cultural activity in the state of Texas. 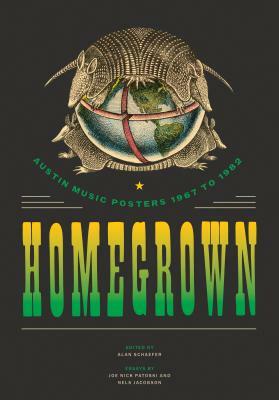 This book presents a definitive survey of music poster art produced in Austin between 1967 and 1982. It vividly illustrates four distinct generations of posters--psychedelic art of the Vulcan Gas Company, early works from the Armadillo World Headquarters, an emerging variety of styles from the mid-1970s, and the radical visual aesthetic of punk--produced by such renowned artists as Gilbert Shelton, Jim Franklin, Kerry Awn, Micael Priest, Guy Juke, Ken Featherston, NOXX, and Danny Garrett. Setting the posters in context, Texas music and pop-culture authority Joe Nick Patoski details the history of music posters in Austin, and artist and poster art scholar Nels Jacobson explores the lives and techniques of the artists.